Potentially extremely dangerous realistic rogue waves — also called as freak waves — can now be controlled and generated at will in laboratory environments, in similar conditions as they appear in the ocean. This will help us not only to predict oceanic extreme events, but also in the design of safer ships and offshore rigs. In fact, newly designed vessels and rig model prototypes can be tested to encounter in a small scale, before they are built, realistic extreme ocean waves. Therefore, initial plans may change, if models are not resistant enough to face suddenly occurring freak waves. Potentially extremely dangerous realistic rogue waves can now be controlled and generated at will in laboratory environments. The 260-meter long German barge carrier MS München was lost mysteriously at sea in 1978. The final communication message was a garbled mayday message sent from the mid-Atlantic. Afterwards, only a few bits of wreckage were found, including an unlaunched lifeboat. The most accepted theory is that one or more rogue waves hit the MS München and damaged her. Rogue waves — also called freak waves — are unusually large surface waves that occur in the ocean. People have usually reported them as having appeared suddenly or without warning, sometimes with tremendous force. A researcher from Aalto University has now learned how they may appear in realistic oceanic conditions. – Potentially extremely dangerous realistic rogue waves can now be controlled and generated at will in laboratory environments, in similar conditions as they appear in the ocean. This will help us not only to predict oceanic extreme events, but also in the design of safer ships and offshore rigs. In fact, newly designed vessels and rig model prototypes can be tested to encounter in a small scale, before they are built, realistic extreme ocean waves. Therefore, initial plans may change, if models are not resistant enough to face suddenly occurring freak waves, says Professor Amin Chabchoub from Aalto University. 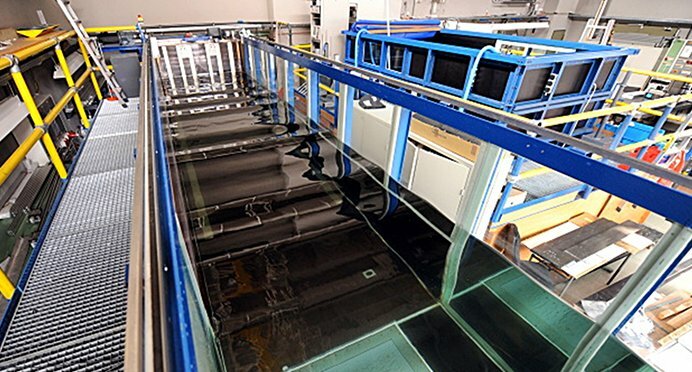 For a couple of years, the research team around Professor Chabchoub has already been able to create steered rogue waves in laboratory wave flumes. However, this has only succeeded in perfect regular wave conditions. In nature, this is rarely the case.